We know there are many ways to approach a project and we are flexible with the resources you need to accomplish your goals. Here are some of the options. The simplest, most cost-effective approach is Design+Build. Share your vision with our designers and then we’ll help you refine it and create a Personal Cost Analysis (LINK TO PCA page/info). We’ll create multiple conceptual designs with accurate pricing for each option. Once a design is finalized we’ll create a construction plan, order the materials, manage the construction with minimal disruption to your busy life, and follow a concise schedule that will make sure you’re enjoying your improved home as soon as possible. In essence, we will be your trusted partner from initial design through to project completion. Choose this option to minimize stress and get the most for your remodeling dollars. 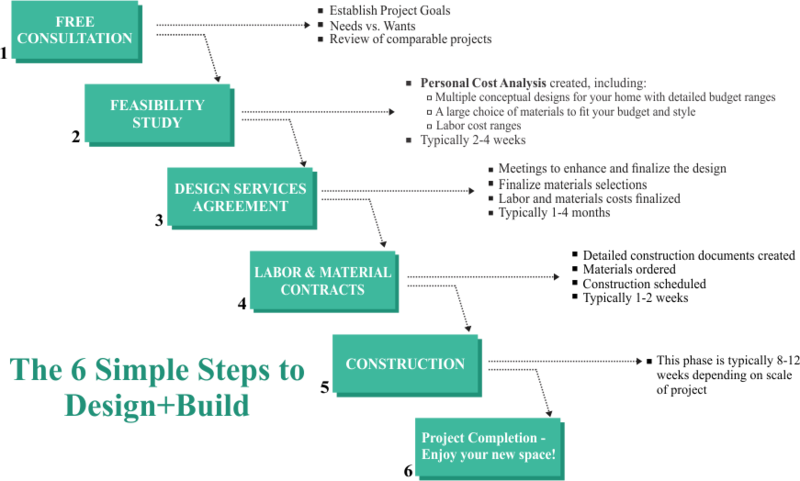 Ready to explore the possibilities, but want to make sure the project is feasible? Or do you have existing plans that need to be updated or modified? Or perhaps you already have a general contractor you know and trust, but want to make sure you have the best design possible. Our architects, interior designers and specialized kitchen and bathroom designers are ready to provide what you need: from conceptual designs through detailed construction documents. Not sure where which category you fall into? Don’t worry. We’re just letting you know that there isn’t a “one solution fits all” approach to our work. We have many design and construction resources for you to take advantage of. We’ll talk through all of the options to find the right fit for your project. We invite you to talk to us and be inspired! Already have completed design and construction documents in hand? We’ll be happy to provide you with a competitive cost and access to our in-house construction team of professionals. Your project will be expertly managed and every detail of the construction overseen, from demolition to plumbing to finish millwork. Along the way, if questions about the design arise, or you wish to make changes, we can also provide the services of our team of architects, interior and kitchen/bathroom designers.